Take a hard look at your own health, and see where you are right now. The fewer symptoms you have the better. Here’s a little graph to show you the stage you are at with your health. 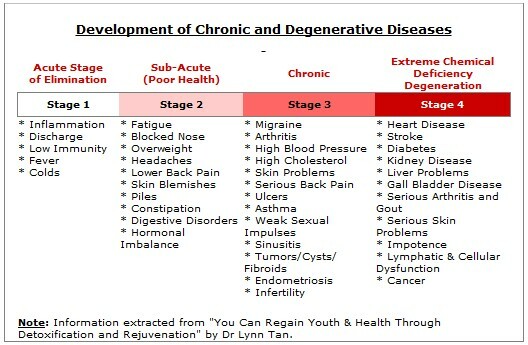 Most diseases start from a simple inflammation or a discharge that you would ignore (see Stage 1 in chart below). Then you start feeling fatigue, constipated, have a headache, or lower backache or even simple skin blemishes. These are all signs of the beginning of poor health (see Stage 2 in chart below). If at this stage, you start to realize and take action and start eating and living healthy, there might yet be hope that your problem may be reversed. When the doctor declares that you have high-blood pressure or cholesterol, or you have asthma or worse, serious joint pains or even tumors, you would know that you are at Stage 3 where you chronically encounter very poor and weak health. You might also want to look at this checklist to see if you have toxins overload. Chronic disease: A disease that persists for a long time. A chronic disease is one lasting 3 months or more, by the definition of the U.S. National Center for Health Statistics. Chronic diseases generally cannot be prevented by vaccines or cured by medication, nor do they just disappear. Eighty-eight percent of Americans over 65 years of age have at least one chronic health condition (as of 1998). Health damaging behaviors—particularly tobacco use, lack of physical activities, and poor eating habits—are major contributors to the leading chronic diseases. Chronic diseases tend to become more common with age. The leading chronic diseases in developed countries include (in alphabetical order) arthritis, cardiovascular disease such as heart attacks and stroke, cancer such as breast and colon cancer, diabetes, epilepsy and seizures, obesity, and oral health problems. Each of these conditions plague older adults in the US (and other developed nations). Chronic diseases are diseases of long duration and generally slow progression. Chronic diseases, such as heart disease, stroke, cancer, chronic respiratory diseases and diabetes, are by far the leading cause of mortality in the world, representing 60% of all deaths. Out of the 35 million people who died from chronic disease in 2005, half were under 70 and half were women. Let’s break these definitions down in bite-sizes to better understand what chronic disease really is, according to interpretations by Modern Medicine (MM) vs. Natural Healthcare (NH). Notice that MM just cannot see how accumulation of toxins are the cause of chronic diseases. The MM approach is to prescribe a drug for every symptom and/or, more aggressively, removal of “defective organs” through surgeries. Modern Medicine says: “A disease that persists for a long time”; “disease of long duration and generally slow progression”. Natural says: It’s a disease of long duration because of the continuous accumulation of toxins that are slow poisons in our body system. Modern Medicine: “Chronic diseases generally cannot be prevented by vaccines or cured by medication, nor do they just disappear”. Natural: Modern Medicine is always in search of a “certain drug” to attack, treat, or “kill” a disease. Therefore, in their search for that “pill that cures all“, they have overlooked the possibility of allowing our bodies to self-heal through proper detoxification and optimum nutrition. Modern Medicine recognizes that chronic diseases “do not just disappear“. Rightly so. As long as the toxins stay in the body, the diseases would not disappear. Only when detoxification measures are appropriated, can we hope for the diseases to be reversed and to disappear. Modern Medicine: “Chronic diseases tend to become more common with age”. Natural: Chronic diseases used to be found only among the aged, but in recent years, more and more young children and even babies are even found to have a chronic disease. Because of this very toxic world we live in, parents are now even transferring their highly toxic blood to their offsprings. As I mentioned above, Modern Medicine is always in search of a “certain drug” to “cure a certain disease“. They are organ-specific, hence there is a long list of specialists like the cardiologists, neurologists, nephrologists, pulmonologists, etc. Chronic diseases are really just toxins build-up and overload in our body system, due to daily exposures to toxins in our toxic environment. Coupled with lack of nutrition, our cells degenerate/die or are mutilated and they cannot be salvaged unless these toxins are removed quickly and our cells fed with optimum nutrition to nourish it back to health. For example, you hear a diabetes sufferer being “sentenced” to a lifetime of medication. These medications can only “control” the blood sugar level but don’t really “heal“. 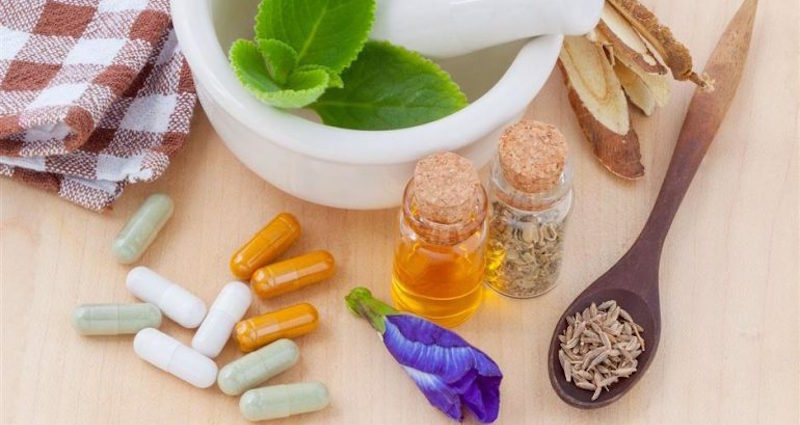 The direct/indirect side effects of these long-term medications are eye disorders, nerves degeneration, poor blood circulation, high cholesterol, high-blood pressure, arteriosclerosis, heart diseases, yeast infections, stomach ulcers, gastritis, kidney failures, etc. But, the doctor will tell you that they are all related. Do you realize that these all come about really because of the side effects from the medications from treating diabetes in the first place? Is the long-term medication to “control blood sugar level” worth it after all? Consider this other scenario with Natural Healing. In a diabetes type II patient, the problem is that the insulin is not able to reach the relevant receptors within the cells because they are blocked by excess cholesterol. An intensive liver detox program is being administered for a few weeks, in conjunction with optimum nutrition. During this time, the liver is cleansed and the blood cleaned up, cholesterol level is brought to normal. Now the natural insulin is able to reach its destination in the cells, and the excess sugar in the bloodstream is normalized. After this detox program, the ex-diabetes sufferer now needs only to maintain a healthy lifestyle, and continue to take her optimum nutrition. She will be mostly free from all other health problems that were “supposed to be related to diabetes”. Which approach to a chronic disease is more desirable? The answer is obvious!! The natural healing approach to chronic diseases by eating fresh plant foods are so simple that the average mind is not impressed with its simplicity and cannot accept that it is the most unobtrusive method to help our body with its self-healing. Remember, our bodies are created by our Maker to be intelligent enough for tough survival and programmed to heal by itself when fed the right food. We “feed” our cars with the right fuel, so why are we not feeding our body with the right “fuel”? I’m slightly confused with my health, I do have at least two stage 3 chronic problems, although my higher than it should be blood pressure often returns to normal, my high cholesterol doesn’t. I never have drunk sugary drinks, I do on occasions eat chocolate and biscuits but not never excessively(maybe at Christmas). I do drink alcohol but usually only at weekends and I never get drunk, just 1, 2 or 3 drinks usually. I’m 55 people always think I’m ten years younger. I’m fit, can run 7 miles no problem, I try to meditate everyday, I have been juicing/nutrabulleting for the last 10 years. I generally eat healthy, loads of veg, salad and fruit, not too much red meat, although when I do it’s fat n’all. I drink lots of water, I have good skin for my age, not too many wrinkles. But I do have bad back, due to dodgy hips that I was born with. Bed knees and ankles from sporting injuries. I suffer from anxiety even though I don’t feel anxious, which causes my high blood pressure, dizzy spells, headaches, palpitations etc. I’ve recently had a lung infection but don’t understand how I got it, I’ve had a sore throat, ear and neck pain for months. But I’m physically fit and look young for my age. I’m quite strong willed can easily give up sugar or alcohol or both completely for a month. It’s all a contradiction which is baffling. I’m about to look up one of you detox programs. Hi Roy, a good place to start your detox is with a gastrointestinal cleanse. You can look it up here: https://juicing-for-health.com/gastrointestinal-cleanse.